What is it about 80’s computing icons making a comeback as a Netbook maker? First, the relaunch of the Commodore brand – if by name only – with the catchy titled UMMD 8010/F. And now it’s the turn of Apricot Computers who, after being left dormant for years by former owner Mitsubishi Corporation, have re-entered the UK market with the rather nice looking PicoBook Pro. The device meets the typical specs of most Netbooks currently doing the rounds, sporting a 8.9 inch wide screen screen (1024 x 600), 1 GB Ram, 60 GB hard drive, VGA output, 1.3 MP webcam, Wi-Fi, Bluetooth, two USB 2.0 ports and a 4 in 1 card reader. The PicoBook Pro comes in two flavours: Linux (Novell SUSE Enterprise) and Windows XP. In terms of how Apricot intends to differentiate the PicoBook Pro from others in this crowded market, the company has chosen to use a VIA chipset rather than Intel’s Atom platform, which CEO Shahid Sultan told me offered better integrated graphics and at least as much bang for your buck. 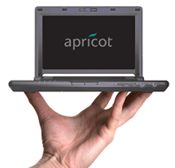 (Having said that, he did hint that next for Apricot might be an Atom-based Netbook with a larger screen.) The company also claims its Netbook is one of the greenest in the marketplace, and Sultan was keen to talk up the build quality of the PicoBook Pro compared to competing products such as the “plasticky” Eee PC, making it more suited to business users. I got to spend a few minutes with the PicoBook Pro at a press event on Thursday, and my first impressions were good. Expect a full review in the next few weeks.